You will definitely agree that staying in shape whilst having a full time job and other responsibilities is already complicated. Now, trying to keep track of how many calories you are consuming or burning is even harder, right? Overall, keeping a balanced life is not as easy as it sounds, isn’t it? However, there is something that can give you a hand with that: a fitness tracker. 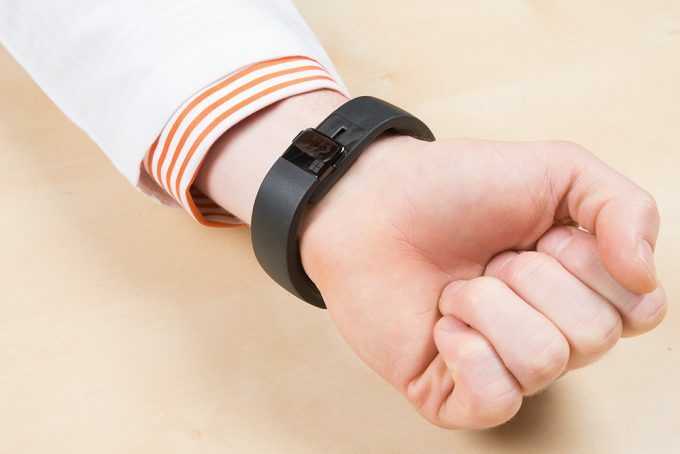 These small items come in the form of a bracelet and they keep track of many different things, from calories burnt to steps taken, or the amount of time you’ve spent walking or running. Plus, having them on your wrist will constantly remind you of your fitness goals. 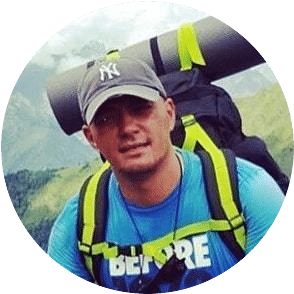 Now, it’s hard to find ones that are actually good and affordable, that’s why we came up with this article, which will look in detail into the best cheap fitness trackers. We will start by giving you a list of the most important features to consider before getting one. Then we will take a separate look at models and analyze them so that then you can decide which one is better for you. Hopefully, by the end of the article you will be able to buy the one that fits you the best. A fitness tracker is one of those items that you want to make sure you will choose adequately. The reason for this, it’s because you will be looking at it to try and improve your health and fitness regimes. You don’t want an item that doesn’t measure what you actually want to track. If you have had a history of high blood pressure or heart problems, you want one that has those features, if you only want to lose weight; you want one that measures calories. Below you will find the most relevant features to consider before buying a fitness tracker. Like with pretty much any item nowadays, weight is always a feature to consider. Most of the fitness trackers are very lightweight bracelets, and even very comfortable to wear. Nonetheless, depending on you, this can be a feature to consider. Some prefer the lightest of them all, wristbands that you won’t even notice that you are wearing. Others, will prefer to feel the weight, that way they are constantly reminded that they are wearing it and that they should use it. Whatever you prefer, but consider the weight. 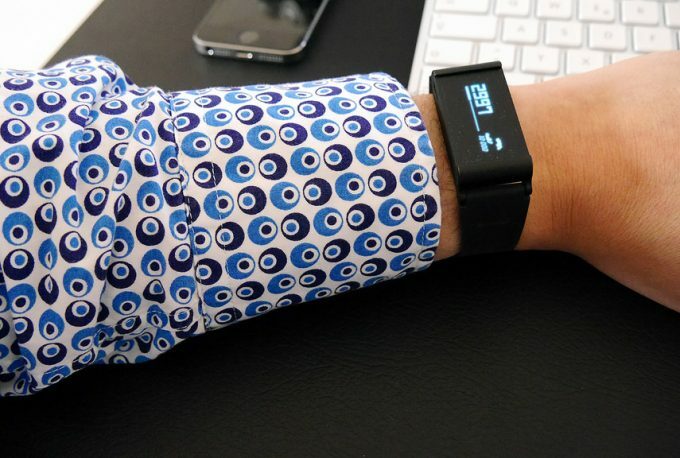 Most likely your fitness tracker will either accompany you everywhere, or even replace your watch. Are you a businessman? Do you work in a more creative environment? Or do you care about fashion? These are questions that you need to answer before picking any style. Fortunately, nowadays most fitness trackers come in a wide variety of colors and have very stylish and modern designs. Some of them can be more elegant too, targeting business people. Think about when and where you will wear it, and then choose a style that suits you. Do not overlook this feature. Sometimes these items take a long time charging, for example, more than two hours. That means you’ll have to charge them at night and they won’t be able to track your sleeping pattern. If you don’t mind that, it’s fine, but if you do, you want one that charges quickly and has a USB charger, so that wherever you are, you attach it to your computer and in an hour or so it’s ready to be worn again. 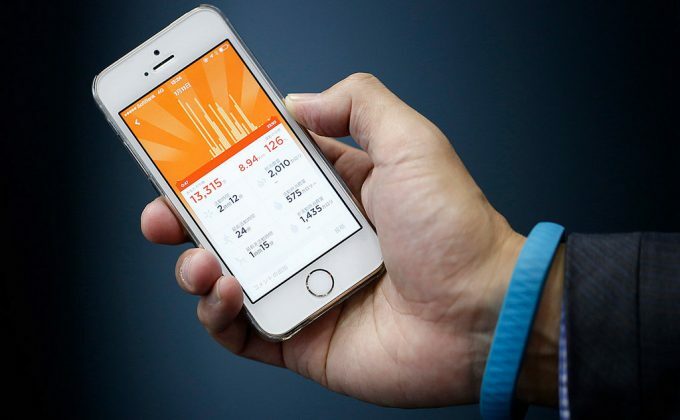 Most fitness trackers are now compatible with both iOS phones and Android phones. They can connect via Bluetooth to any of the two and you can access the data from there. However, make sure you look into that so that it does work with your phone. On top of that, read about the Bluetooth strength and connection, if it’s reliable or not, if it reads better one phone or the other. There is nothing worse than having a device that doesn’t connect properly to your phone. This was mentioned in the introductory paragraph. You want to make sure that whatever tracker you buy, it measures what you actually want to keep track of. Many people buy them only to measure steps, calories and distance, something that all fitness trackers have. However, others want to know their heart rate and blood pressure, and this is a feature not all trackers have. That’s why, it’s extremely important that you look into that. Also, ask how accurate the measurements are, once again, you don’t want one that doesn’t measure accurately such an important thing as your blood pressure. It’s time to get our hands in the mud. 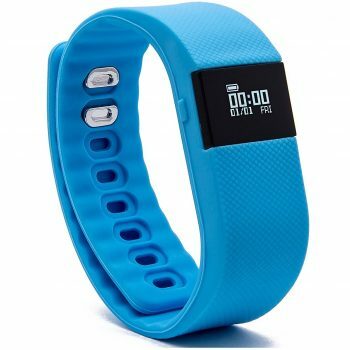 The following list includes the best cheap fitness trackers in the market, the best reviewed ones. You will find a wide variety of models, and we took the time to analyze their features, their best uses and their pros and cons. Read carefully, and then by the end of the article you will know which model to buy. Specific features: 0.86 inches OLED display, records steps, calories and movement distance. 24 hours of continuous recording, sleep monitoring, vibration alarm wake, waterproof, caller ID. Best use: Everyday use, running, hiking. 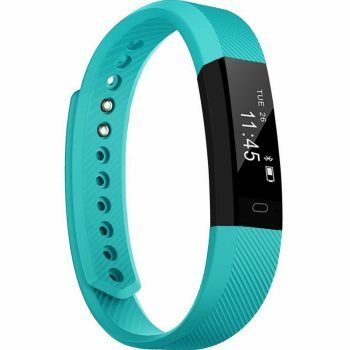 Description: The Bietia Fitness Tracker Smart Wristband is an excellent fitness tracker with a wide variety of features that would satisfy any user. First of all it has a very visible 0.86-inch OLED screen display, so it’s easy to read absolutely everything that it says. It does not read the heart beats or blood pressure, but it does keep track of the basics: calories, steps, distance and sleeping patterns. Add to that a vibration alarm system to wake you up in the morning or let you know when it’s time for you to exercise or do something important. It also comes with a useful caller ID with vibration feature, to alert you whenever you are receiving a call. It is waterproof, and it can be used in the shower, but not for swimming. It is recommended not to wear it over extended periods of time underwater, as it can get damaged after prolonged exposure to salt water, for example, if you go swimming in the sea with it. Related: The Merdumia Wireless Bluetooth Earphones are a good buy, alongside this fitness tracker. Both devices can be connected via Bluetooth to your phone, that way you can go running whilst listening to music and tracking your overall fitness. Specific features: Measures steps, distance, calories and sleep pattern, anti lost alert and find-phone alert, syncs time and date with smart phone, fast charge (20 minutes), USB charger. Best use: Daily use, outdoor sports. 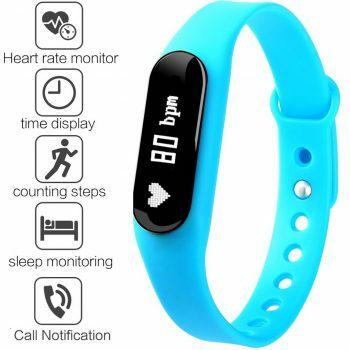 Description: The Blueweigh Rainbow Activity Tracker is a very solid fitness tracker. For a cheap price you get a very good product. As a matter of fact, one of the best features, which differentiates this tracker from others, is the fast charge. In just 15 to 20 minutes it will be fully charged and ready to be worn again. No need to wait long, just plug it into your computer via the USB port, and a few minutes later it is ready. It measures the basic things such as the distance, the steps and the calories and sleep pattern. However, this device also has a really good feature, which is the anti lost and fin-phone alert. If you can’t find it, you can track it with your phone. Vice versa, if you can’t find your phone, you can activate an alarm on it by using the tracker. It also has a sedentary alert, so if you haven’t moved for a while, except when sleeping if you deactivate it, it will start either vibrating or it has an alarm. The idea is to remind you to move around, walk, be active and that way improves your fitness. Related: The USB Charger for Blueweigh Activity Tracker is a handy item to have. In case you don’t have a computer near you, this USB Charger can be taken around with not much trouble and keep your tracker charged. 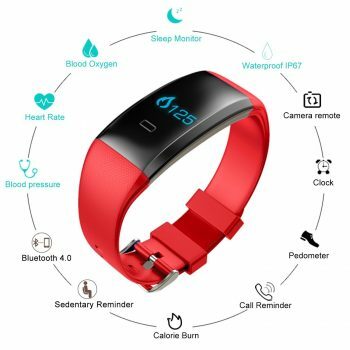 Specific features: Tracks steps, distance, calories and minutes of activity, get call and SMS notifications, waterproof, tracks sleeping patterns. Best use: Daily use, swimming, running. 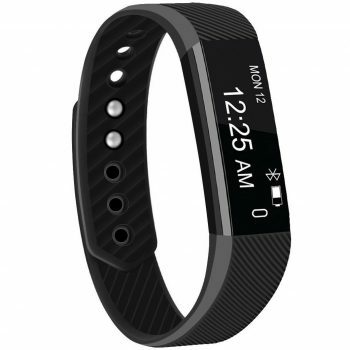 Description: The Fit Fire Tracker Smart Band is one of the best models out there. It is a bit more expensive than others, but that might be due to one of its best features: being waterproof. Contrary to most of the other models, which advertise themselves as waterproof but actually can only withstand a rinse, this fitness tracker can be used underwater. If you are a swimmer, this is your product. Once again, as the others, it tracks the basics, the steps, the distances and the calories burnt. It also has a caller ID and SMS notification feature, so that wherever you are, you remember to call back or answer any SMS. It also has an interesting feature, and it is that you can control your cell phone’s camera from the wristband. That way, you can set your phone far away from you, and then just activate the camera from the device and take the picture. Also, its design, is one of the most stylish ones on our list. Some of you might love the fact that it comes in many different colors, yet, some may find the full black option as a very elegant choice. Related: The Replacement Bands for Fit Fitness Tracker are a good idea to have. The wristband itself isn’t so durable, so having a replacement is always a good idea. Specific features: Measures heart rate, steps, distance, calories, caller and text ID, music control, 7 day data storage. Best use: Running, daily use, swimming. Description: The X-Cheng Fitness Tracker Smart Bracelet is probably the classiest and most stylish one of all the models in this list. It stands out for its slick and modern design. It comes in wither full black, red or white, and they are all shiny and look good. Reviewers really like the look of it. It is also an excellent tracker, capable of doing many extra things that other previous models don’t. As a matter of fact, it measures the heart rate of the users, besides the basics such as steps, distance and calories. If you have had any heart problems, this is a good model to have to keep track of your heart rate whilst doing any sports activities. It is also completely waterproof, meaning it can be sued underwater for swimming anywhere. It will last long, and it won’t get damaged easily. It is a favorite amongst swimmers. Another great feature is the fact that you can control the music in your phone or other device form this tracker. As well as having a 7-day storage capacity, to keep track of your weekly measurements. Related: The TaoTronics Bluetooth Headphones can come in handy with this tracker, since it controls the music from the wristband, you can go running and from your wrist control what you are hearing. Specific features: Measures heart rate, blood pressure, blood oxygen, sleep monitor, steps, distance and calories, it is waterproof caller ID and SMS alerts. Best use: Daily use, running, walking, swimming, blood pressure readings. Description: The Ten Tenco Fitness Tracker Watch is one of the most complete fitness trackers out there. It has a great feature that most of the others don’t have; it measures your blood pressure and your blood oxygen rate. 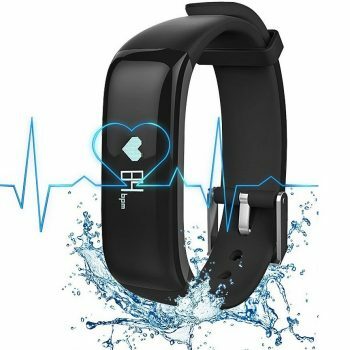 If you are a person concerned about your blood pressure levels, having a tracker that constantly measures it is an excellent idea, and this cheap fitness tracker gets that job done. Furthermore, it is completely waterproof, meaning it can also be sued underwater, for swimming or diving. It will resist the water without any problems. It does have a downside, and it is that hot water ruins it. One of the warnings is not to use it with hot water at all, not even for showering. It also keeps storage of the week’s measurements. This is particularly useful for the blood measurements, that way at the end of the week you can look at your results and know how well you did or not. Related: The Hhusali USB Port is a good item to buy alongside fitness trackers. It will allow you to carry it with you or have it at the office to charge not only your tracker, but other devices. Specific features: Water resistant, calendar alerts, caller ID and SMS alert, music control, measures heart rate, steps, calories and distance. 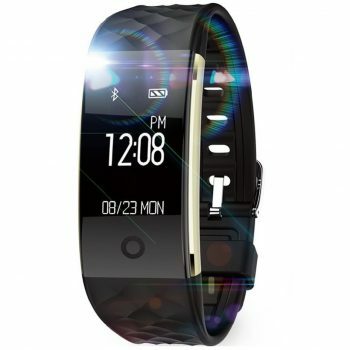 Description: The MJFOX Fitness Tracker Smart Bracelet is a stylish and very practical tracker, of very good quality too. Despite being slightly more expensive than others, it tends to last longer, according to reviewers. It is also very stylish, coming in black, white or red, and looking good, even on those who have to be dressed in formal wear every day. Unfortunately, it is not waterproof, but only water resistant, so that is something to be kept in mind, not to wear underwater. It also has the downside of being a heavier wristband than the others. The reason for this is that this looks more like a watch than a simple wristband. It is made of a stronger and heavier rubber. As for the features, it measures the heart rate, something not all of the others do. Therefore, if you are concerned about that, this is a good item to have. It also gives you call and SMS alerts, as well as a calendar alert so that you do not miss any important business meetings. Related: The Aduro 6 Port USB Charging Station is a portable charging station that can be used for this tracker. Take both with you to the office or when traveling and make sure your tracker will always be in charge. 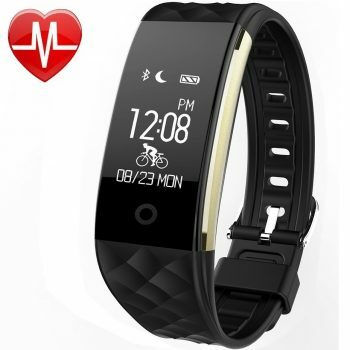 Description: The TopBest Fitness Tracker Bracelet is a basic but good and cheap tracker. It has a very affordable price, and that is reflected on some of its features, as it measures only the basics, like calories, steps and distance. It is water resistant, but can’t really go underwater. However, it does have some excellent things. Let’s start by the remote control for the camera of your phone. That way you can take pictures by placing your phone in one place and accessing the camera with this tracker. It also has a sedentary and drinking alarm. If you are not moving, it will alert you to go and move, and it will alert you to drink water during intervals that you can set up yourself. That way you keep good track of your fitness and health. The main issue you might find, comes in the durability of this product. As you might expect from a product in this price range, it can sometimes happen that, after a while, it stops working properly. Related: The Jpodream Wireless Earphones are ideal to have with this tracker, as via Bluetooth you can connect both to your phone and walk or run around listening to music whilst measuring your calories. Specific features: Tracks steps, distance, calories, heart rate and sleep, caller ID and SMS alert, wake-up alarm, touch screen. Best use: Daily use, running, cycling. Description: The Gosund Fitness Tracker Bracelet is one of the lightest and most durable trackers out there. The wristband it comes with is made of a very light rubber, with the only issue of sometimes getting damaged before time. However the device itself, it lasts very long. As a matter of fact, it comes with a one-year warranty, which most of the others don’t. You can be certain this one will not stop working after a few months. It comes with other useful features such as the fact that it measures your heart rate, as well as tracking steps, calories, distance and sleeping habits. It also includes a caller ID and SMS alert, as well as having a wake up alarm. Probably one of the best things about this cheap fitness tracker is the fact that it has a touch screen. This saves you the hassle of having to use the clicking systems that most of the others have. The touch screen is an advanced technology for fitness trackers, and it facilitates the user friendliness. Related: The Gosund Fitness Band for the fitness tracker of the same brand is a good idea to buy. 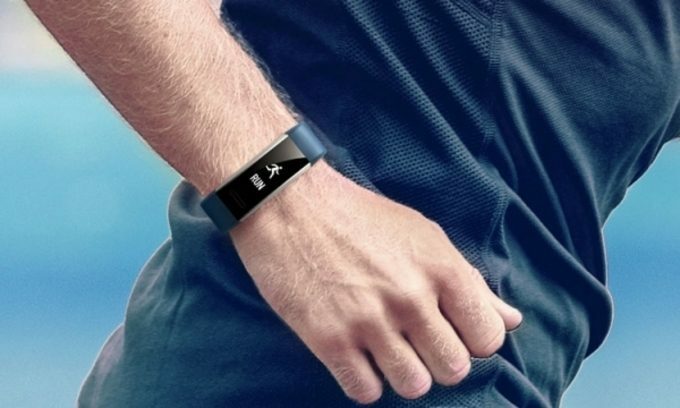 IF you buy this fitness tracker, you never know when the wristband might take a hit and actually get damaged, so you’ll want to move the tracker into a new one. 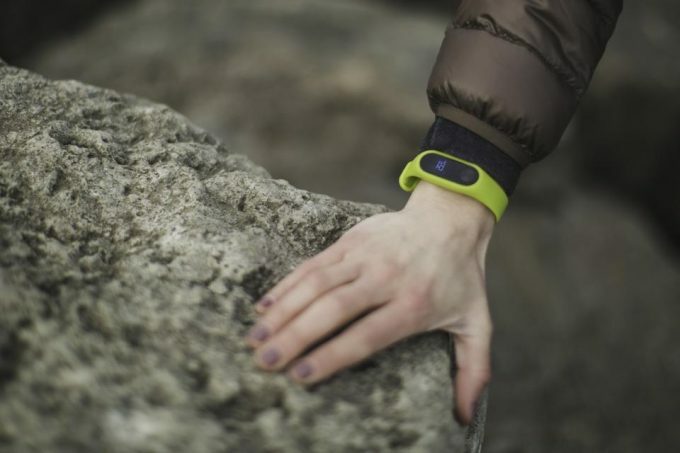 Fitness trackers can be much more than just a wristband measuring how many steps you took in a day. As you might have learnt in this article, they can actually help you have a good idea of your health, as well as remind you of calls or SMS. They are very smart devices that can be with you at any time. Nonetheless, finding a good one can be tricky. 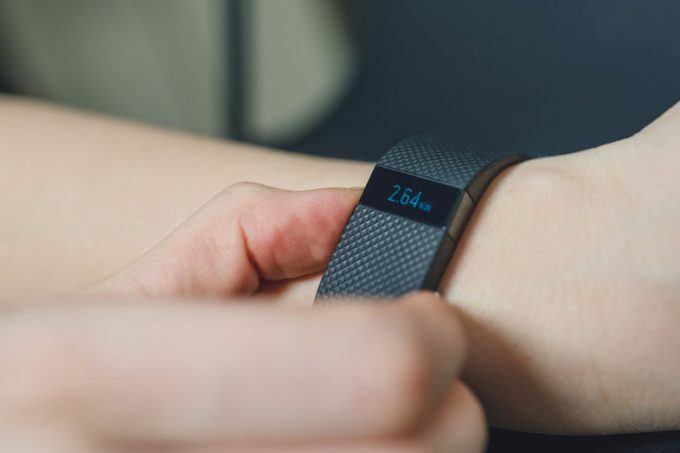 The list we gave you features the best cheap fitness trackers out there, and each one has its own positive features that might suit you. However, we also hope that you were able to gather enough information from our analysis, in order to choose the correct one. What has been your experience with fitness trackers? Did we miss any particular model that you might like? Please share your opinions and questions in the comments section below; we would like to hear from you! Best Rain Gear: Protect Yourself from the Rainy Weather!